Versions of the dress are used in various activities, here ballroom dancing. Victor Fung and Anna Mikhed dancing a tango in 2006. A dress is one of the basic styles of female clothing. It is a garment of a skirt (bottom half) with an attached bodice (top half). The colouring and style of the dress gives the effect of a one-piece garment. A dress is also known as a frock or a gown. In Europe and the Americas, dresses are worn by females of all ages as an alternative to a separate skirt and blouse or trousers. There are many types of dresses. A dress is usually worn at formal occasions, such as a wedding or a dance. It is also worn in the summer to keep cool. Younger females tend to prefer shorter skirts than older females. 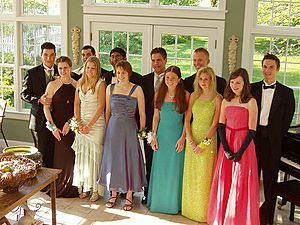 Gown or Long Dress - a woman's formal dress, usually having a floor-length skirt. Midi dress - a “midi” is used to refer to any dress or skirt that has a hem which hits at mid-calf – halfway between the knee and ankle. 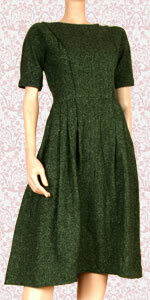 Knee length dress- Hemline ends at knee height. Mini dress (1960s) - a very short dress, at least four inches above the knee. Hems hit on the thigh, above the knee. Dress Facts for Kids. Kiddle Encyclopedia.